Park is a small village in County Londonderry, Northern Ireland. It sits on the banks of the River Faughan and the foothills of the Sperrin Mountains near the village of Claudy. Learmount Castle is situated in the forest, and has stood for hundreds of years. The local sports clubs are St Joseph's Craigbane and St. Mary's GAC Banagher. The teams play at Gerry Crossan Park and Fr. McNally Park respectively. It also has its own nine-hole golf course, set deep in the Sperrins. The Irish novelist Antonia Logue was born in Park. ^ Map and Placenames Key Archived 2012-04-03 at the Wayback Machine Derry City Council. Retrieved 11 October 2011. 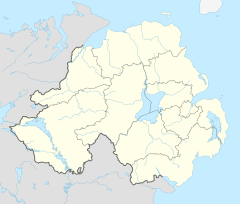 This article related to the geography of County Londonderry, Northern Ireland is a stub. You can help Wikipedia by expanding it. This page was last edited on 17 February 2019, at 23:29 (UTC).